The OMEGA™ HH501DK is a rugged, easy to use thermometer with 4 standard miniature connector inputs. 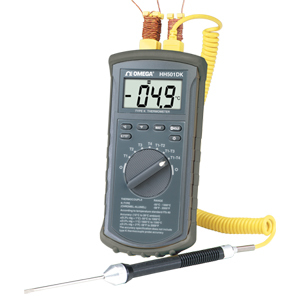 It accepts K type thermocouple probes and covers ranges from -50 to 1300°C (-58 to 1999°F). It also provides differential temperature measurement readings of T1-T2, T1-T3, T1-T4, as well as individual readings of the 4 inputs. Polarity: Automatic, positive implied, negative polarity indication. Zero: Automatic Low Battery Indication: visual indicator is displayed when battery voltage drops below operating level. 참고: Unit comes complete with user’s manual, 4 beaded K T/C, alkaline battery and rubber boot. Handle probe shown in photo sold sepatately, see probe section.